Down the Byline: Soccer Capital of America? The advertisements for the all star game coming up on Wednesday have been advertising Kansas City as the "Soccer Capital of America." Over the last three years, Kansas City has turned from an afterthought in the soccer community to one of the centers of attention when it comes to MLS and the US national team. Kansas City will be one of only two cities (Columbus the other one) to host games in both rounds of World Cup qualifying for the 2014 World Cup. But is KC really the "capital?" Just 4 years ago, the then Wizards were averaging 10,287 people per game at Community America Ballpark and were averaging just under 11,000 per game for their entire 15 year history. Then came the opening of Sporting Park. Since then, KC is averaging just under 19,000 a game. A long way to come in not even three full years of being at the stadium.And while that turnaround is impressive, does it really make KC the capital of American soccer? There are a number of cities that could make the claim to being the capital right now though. Columbus could make the claim for having the first soccer specific stadium in MLS, and continuing to prove that it can provide a solid home field advantage for the US national team at Crew Stadium. Seattle as well could make the claim. For all the stick people (myself included) give Seattle for an elitist attitude and the "Seattle invented it" jokes, Seattle has proven to have a strong fan base, that supports their team. And proved in the US qualifier against Panama that they'll come out to support the US as well, and up the bar for everyone with a fantastic performance. Portland also could have a claim to the title with fantastic support that has been great since they were in the USL. Portland though tends to go with the Soccer City USA nickname. Even St. Louis could make a claim as the capital. Although they don't have a team now, St. Louis was the center of US soccer for a while and was "America's first soccer capital." But while they've done well to sell out games with big name European teams, the lack of a professional outdoor team in the city hurts any claim it has to the title now. 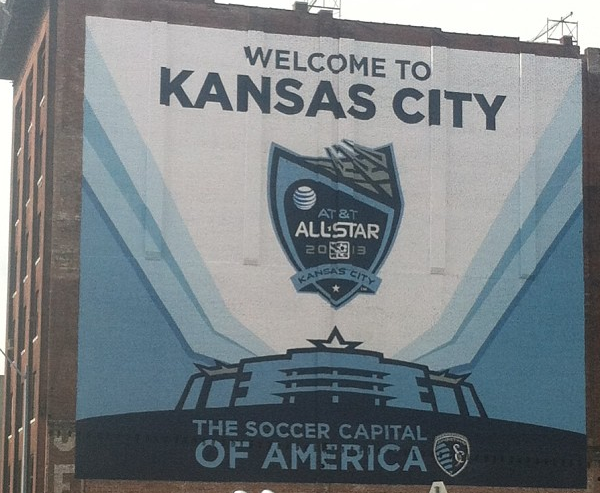 So is Kansas City the "Soccer Capital of America"? Robb Heineman certainly believes so. "...we really feel that way, whether it’s our team, our stadium, the project that we’re working on here with U.S. Soccer around the training center that will advance over the course of this fall, whether it’s our youth development. We want to be what soccer really is in America, with the ultimate aim of that to have the U.S. win the World Cup" Heineman told the Star this week ahead of the game. Personally I'm not ready to give KC that crown quite yet. KC has shown it can support Sporting KC when it's leading the East and making the playoffs, but let's see what happens when KC has a down year or two. The true "Soccer Capital of America" will still be showing up when KC is struggling a bit. I won't make much comment on the support for the US, cause even when the Wizards were drawing flies at Arrowhead, the US still drew 37,319 for a midweek World Cup qualifier against Costa Rica back in 2001. A record for a midweek qualifier that stood for 12 years until Seattle drew 40,847. So KC has proven that it'll support the US. While I don't believe that I'm ready to give KC the crown yet, I think KC could well be on its way to getting the crown. I've said before, Sporting KC has come in during a perfect storm in KC sports. The Royals continue to struggle in the standings and the Chiefs haven't won a playoff game since I was 11. The stadium created a buzz for the team and the team has run with it. They've done a much better job of marketing the team and getting the name out there. And winning helps a lot as well. I do completely agree with one of Heineman's main points. I want, and believe that KC can be what soccer really is in America. I think KC as a whole has the mindset that can make it a place that can be looked at as the "stereotypical" US soccer city in the US. They're well on their way, now they need to keep it up and not fall back into old habits or get complacent with their place. its just marketing. who cares. I refuse to watch or read anything about Aurelien Collin's fashion line. I am a Seattle guy so of course I think Seattle is the undisputed soccer capital. And yes, we are superior. But more importantly, it is great to see more than a few cities embracing MLS teams. More fans equals more money for better players equals better soccer. The way things are going I expect MLS to be a world class league within a generation.